"I'm not going to be the commander who allows irreparable harm to an ecosystem," Vail added. "If it was very clear we needed to remove those dams, we would recommend it." 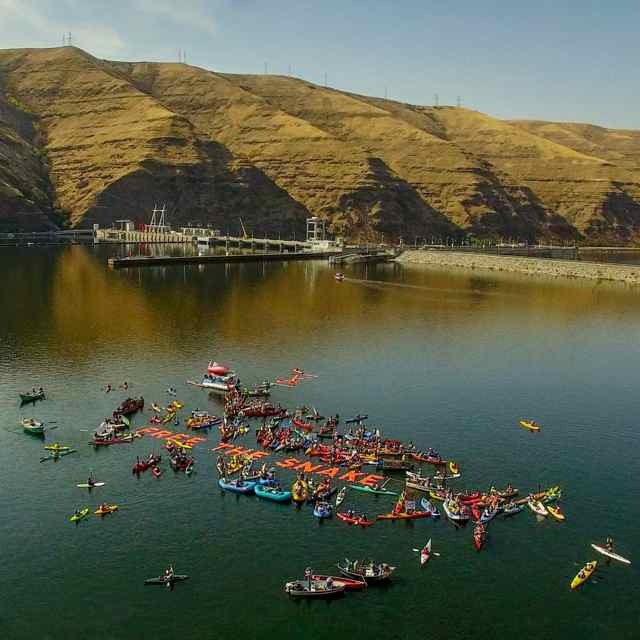 A flotilla of about 150 boats left the Wawawai Landing near Colton on Saturday to demonstrate for removal of four dams on the lower Snake River. The coalition of environmentalists, tribal members and outdoor enthusiasts want the Lower Granite, Little Goose, Lower Monumental and Ice Harbor dams breached to improve habitat for salmon and steelhead in the lower Snake River in southeast Washington and throughout the Columbia River system. They unfurled a banner about 120 feet wide that read "Free The Snake" near Lower Granite Dam. "Today is the day when the tide gets turned," Brett Haverstick, a rally organizer representing Friends of the Clearwater, said to the hundreds of people who participated in the flotilla. "It's your country. It's your water." This summer, endangered salmon and steehead trout died by the thousands because of high water temperatures in the reservoirs created by these dams. The waters become warmer in summer anyway, but the decreased movement of the water adds to the increase in temperatures that make it inhospitable to the fish, according to various wildlife experts who attended the rally. Orca whales depend on chinook salmon and these fish are the mainstay of their diets. Salmon travel through the lower Snake River on their way to Puget Sound, where orcas can be found, said Deborah Giles, science advisor for the Southern Resident Killer Whale Chinook Salmon Initiative. "Removing the lower four dams would open up pristine spawning habitat for these chinook," Giles said. Young fish have problems negotiating the reservoirs and can get lost and die. The spawning journeys are taking longer and the fish become exhausted and depleted. Removing the dams would benefit the entire Columbia River system, Giles said. "I've been asked how can you advocate more salmon for whales when people need food?" she said. "Better conditions in the Snake River would provide more salmon for the orcas and people -- all would have more." The initiative has asked President Barack Obama and federal legislators from Washington and Idaho for support in taking down the dams. Central Idaho communities that depend economically on tourism by outdoor recreationers would benefit if the dams were removed, as seasons for fishing have been shorter, less bountiful and not as frequent as they used to be, said Joseph Bogaard, executive director of Save Our Wild Salmon. "Things have to change in this climate change era," he said. Others who want to see the dams removed also say the dams are no longer needed for commerce. Area agriculture transport has substantially decreased in the river because the goods are being moved by rail. However, about $200 million worth of hydroelectric power comes from these dams and provides power to about 675,000 residences, according to the U.S. Army Corps of Engineers. Passage systems for juvenile fish traveling the Lower Snake River dams provide conditions that now allow for a 95 to 100 percent survival rate, said LTC Timothy Vail, district commander of the corps' Walla Walla District. Adult fish passages were accommodated when the dams were first built decades ago, but getting young fish through the system has required additional efforts over the years. The corps operates the dams, the Wawawai landing and other dam-related recreational facilities, along with overseeing marine navigation in the river area. It also conducts projects intended to improve the habitat for endangered species. The various programs and improvement projects only require spending $62 million of the $200 million generated from energy production at the dams. These facilities provide power without the need to operate coal-fired power plants, and they also help sustain the region's economy through the recreational tourism and cargo movement, Vail said. "It's an excellent value for citizens and it's hard to say these are 'deadbeat dams,'" he said about the term often used by the dam opponents. A few of the people in the flotilla were let through to tour the dam area after the rest started the trip back to Wawawai. "I'm not going to be the commander who allows irreparable harm to an ecosystem," Vail added. "If it was very clear we needed to remove those dams, we would recommend it." The trip was documented by various media. A crew from Patagonia, an outdoor clothing and gear seller, filmed it in its entirety. Movement of the boats was even captured from above using drone cameras. Safety was an important factor because of the large group traveling in mostly small boats and kayaks. People with boating and medical training accompanied the flotilla because strong winds were predicted. There was an evening get together at the Belltower in Pullman for the flotilla participants that included speakers and music.